What is kale, you ask? Kale is a leafy green vegetable that, once upon a time, you would have hated but your mother would have made you eat anyway. 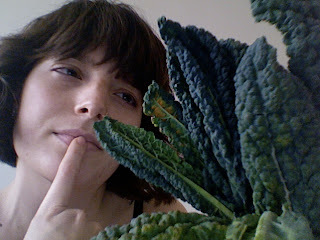 Now that you’re grown, kale is a leafy green vegetable that is sort of strange (what does one make with kale?) but you keep getting it in your produce box because it is in season. So you have to find SOMETHING to do with it because you are not going to let it go to waste (that wouldn’t be very responsible of you) and besides, kale is very good for you. It is leafy, and green. That is almost the definition of “good for you”. If you are anything like me, you take veggies that you are unsure of and turn them into gratin. There is no vegetable that a little butter and cheese will not cure. 2 large potatoes, thinly sliced. 1 bunch kale, stems and inner ribs removed and leaves chopped. A quick note about kale–you have to make sure that you wash the leaves very well. Buggies love to hide in kale leaves. For example, I just had a photo shoot in my bed with my kale bunch so I could get the Still Life with Steffany and Kale shot, above, and now there are bugs in my bed. Boyface is going to be upset. Moving on. Chop all of the vegetables and set aside. Melt the butter in a saucepan. Add the garlic and onion and saute around 5 min, until the onion is starting to become soft. Add some ground black pepper. Add the kale and the saffron, and cook until the kale has reduced to about half of its original size. While you are waiting for the kale to cook, line the bottom of an 8×8 in pan with the potato slices, reserving enough potatoes for a second layer. Return to the kale, add the flour, stir, then add the milk and simmer the entire mixture until thick. Turn off the heat. Sprinkle a layer of parmesan cheese over the potatoes, add the greens, then sprinkle another layer of parmesan. Add the final layer of potatoes on top of the greens, then add more parmesan on top of the potatoes. Cover, and put in the oven. If you don’t have a lid for the dish you are using, you can use a cookie sheet or some foil. Bake for 30 minutes covered. After 30 minutes, uncover, and cook for a final 15 minutes. You want the cheese on top to be browned, and the potatoes to be tender. I originally got this recipe from Rachel Ray-her Greek Wedding Soup. I changed it just a little, added chopped kale and I made it avoglemeno. Avoglemeno is a traditional Greek sauce made of eggs and lemon that is added to soup. Avoglemeno soup is usually made with chicken and rice (that’s how my Dad used to make it for me when I was little, anyway) but the sauce itself can be added to any soup that you like. Drizzle some olive oil (about 1 TB) into a pot large enough to hold 5 cups plus of liquid. Remove the inner stem (unless you’re using spinach) from the leafy green of your choice and chop into small pieces. Saute the greens for about 5 minutes, and add the orzo. Saute for another few minutes, until the pasta starts looking like it is toasted (5 minutes max!). Add the stock and turn the heat to high. While you wait for the liquid to boil, make the meatballs. Mix together the ground beef, breadcrumbs, 1 egg, garlic, parsley, oregano, and salt and pepper. Once the stock is boiling, turn the heat to medium so that the liquid stays as a simmer. Form the meat mixture into balls with your hands and drop them one by one into the simmering liquid. Then, start on the avoglemeno. Crack the remaining egg into a medium to large sized bowl, and scramble. Add the juice of 1 lemon and scramble again. Next is the tricky part. If you have ever made egg drop soup, you will know that if you add egg to a hot liquid the egg will curdle. That is NOT what we want. So the trick is to mix the lemon and egg sauce with one hand while you carefully add little bits of hot stock, about a 1/4 cup at a time. I usually use a big soup spoon, or a small ladle. Continue to add the hot stock a little bit at a time until you have added at least a cup of stock (I prefer to add 2 cups just to be sure) to the egg mixture. Then, turn off the heat to the soup. While the heat is off, stir the soup with one hand and add the avoglemeno and hot stock mix with the other. Once the two have combined, turn the heat up again to about medium and let the soup come to a boil, stirring the entire time. Turn the heat off and check the seasonings, adding more pepper, salt, lemon, what have you. Ladle into bowls and enjoy!